← How to rotate the page while converting url to image? This article aims at teaching you how to rotate the page when converting url to wmf format file.Before that,you should choose a suitable software which support this function and can help you finish the task in a very short time.The most important,it should be an ordinary one to master easily.Little cost will be better to a software!So HTML Converter Command Line will be a good choice which is a powerful HTML conversion product. It allows you to create previews or thumbnails of web pages in a number of different formats, such as TIF, TIFF, JPG, JPEG, GIF, PNG, BMP, PCX, TGA, JP2 (JPEG2000), PNM, etc. HTML Converter Command Line also allows you to convert web pages to PDF, PS (postscript), WMF, EMF vector formats. HTML Converter command line application can be called from within ASP, VB, VC, Delphi, BCB, Java, .NET and COM+ etc. program languages. It uses advanced techniques to allow efficient asynchronous multithreaded operations. 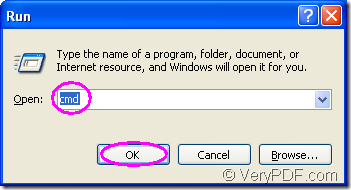 Please download HTML Converter Command Line at http://www.verypdf.com/htmltools/htmltools.zip and you will find that it is a zip file which needs to be unzipped.But that’s not enough.You should register HTML Converter Command Line in cmd.exe dialog box to avoid the situation that some functions are disabled. 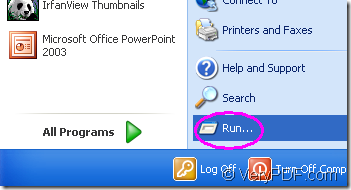 1.Run cmd.exe program by clicking “start”—“run” like Figure1 and input “cmd” in “open” edit box of the popup dialog box showed in Figure2. 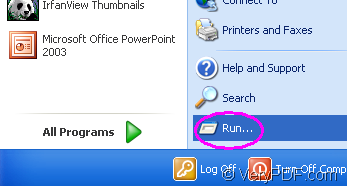 Then use the DOS command “cd” to change the current directory to installation directory of HTML Converter command line and input the register code in the dialog,then press “Enter” button,which means the register process is over.You can see Figure3. The next part of contents are the steps to describe the conversion of url to wmf and the rotation of page. 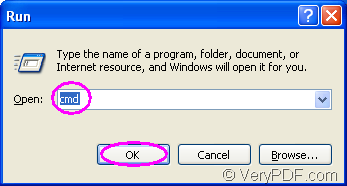 You can ignore this step if you didn’t close cmd.exe dialog box just now.Or you should open it with the way just mentioned or the quick way—the hot key “Windows”+ “R”. htmltools.exe is the called program in this conversion.-rotate value is the parameter about rotating page,www.verypdf.com can be seen as the source file while output.wmf is target file. Please see Figure4,you can input the command line which contains called program,parameter,source file and target file in cmd.exe dialog box. "C:\Documents and Settings\admin\Local Settings\Temp\htmltools\htmltools.exe" stands for the path of the called program—htmltools.exe.Please don’t be afraid of the long path,you can drag the file into cmd.exe dialog box,which is very convenient. -rotate 90 stands for the rotation angle of source file which is set as 90°. www.verypdf.com is the URL of source file.You can input any link you like. verypdf.wmf is the name of target file.If you don’t set the path for target file here,the file will be saved in current directory.If you don’t give name to the target file,the source file will be converted to pdf file. You can find the target file in current directory.Please see Figure5. How to convert url to wmf? How to convert rtf to png? How to rotate the page while converting emf to png? This entry was posted in HTML Converter (htmltools) and tagged url to wmf. Bookmark the permalink.